Yesterday’s opening of the International Civil Rights Center and Museum was a historic day for Greensboro. I shot the events that took place around the lunch counter at the old Woolworth building and will post some images in the coming days. It was a moving experience. 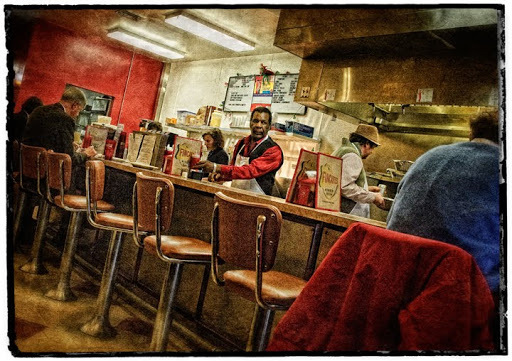 Just down the street from the museum is another lunch counter, one you can still eat at, and everyone is welcome. Fincastles serves up lunch every day. Buttersteak sandwiches and great burgers and fries along with their signature sauce. 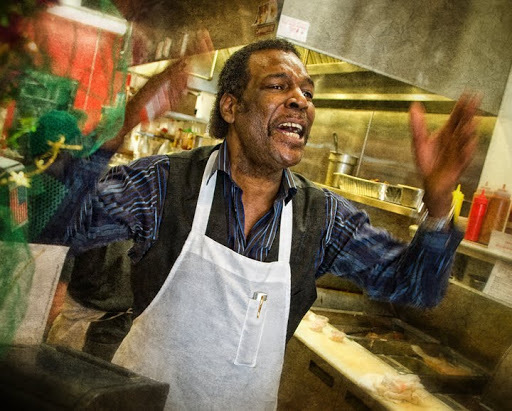 And where else can you get serenaded as you eat with old Motown tunes by “Jaybird” Williams, the singing waiter. Nice photos. I might have to try that place next time I'm in Greensboro. Yeah – definitely get a burger with pimento cheese at Fincastle's – best pimento cheese I have even had! Hey Dan, Nice photos. I would like to purchase one for J-bird. Email me and we can do that. Hey Dan, I tried to email from the link below, but couldn't get anywhere. I am still interested in the j-bird photo. Also, what would it cost to use those two photos for our website? Email me at danrouthphotography@gmail.com and I'll stop by one day. Thanks.